"Nothin's too good for the man who shot Liberty Valance!" I'm going to do a short series the rest of August for Movie Monday. Well, the series will be short. The posts will probably be epic in length :) Consider yourself warned. For a long time now, I've wondered what happened to America's cowboys. Maybe because I'm from a younger state, where cowboys still live and work and contribute. Maybe because I remember when pirates were bad and cowboys were good. But it seems that nowadays, people don't just forget the cowboys, they forget what they stood for, what they represent to the American psyche and identity. The biggest proof of that to me was when international politicians and news services would call Bush a "cowboy" with a sneer on their faces, or refer to our foreign policy as "cowboy diplomacy," and no one on the national scene here domestically was either knowledgeable or ballsy enough to say, "Why, yes, thank you!" Now, we aren't talking about Spaghetti Westerns, or European stories told using American Western archetypes. We are talking about real American cowboys, not the euro-trashed version of cowboys. There's a difference, which explains some of the cognitive dissonance such as described above. So, I'm going to review a few of what I consider to be some of the best examples of cowboys on film. Yes, you'll be seeing a good bit of John Wayne. There's no getting around that, and there's good reason for it. First, I'll just go ahead and get a couple of things out of the way. I wouldn't be doing this if I thought either reading the posts or watching the movies I'm posting about was a waste of your time. All the movies I list should be on your "must-watch" list, if you haven't already seen them. Secondly, if you have seen them, please feel free to contribute your own thoughts in the comments below. Third and finally, this isn't going to be a normal review with a brief plot synopsis, a couple of pros and cons about each movie and a recommendation to watch it. In fact, I'll probably wind up spoiling the plots for you. This isn't about the plots. These are going to be character studies. Now that's we've covered all that...let's get started! Liberty Valance is the perfect movie for a character study on cowboys, because it is one. We have two mains stars, John Wayne and Jimmy Stewart. John Wayne is, of course, the cowboy, Tom Donaphan. Jimmy Stewart is Ransom Stoddard, a fresh-out-of-law school dude who's come to the Wild, Wild West to make a name for himself as a lawyer. The two are set in stark contrast to each other, deliberately. In fact, the two mindsets they represent are really two sides of the same debates that go on today. The opening scenes of the main story tell us everything we need to know about our characters. The majority of the movie is set in flashback. And as the flashback begins, Stoddard is riding on a stagecoach on his way to Shinbone, the rural town where the movie is set. On the way, the stage is held up by Liberty Valance (the always fabulous Lee Marvin) - local highwayman and mercenary. When Valance tries to take a widow's jewelry, Stoddard objects and threatens to have him thrown in jail. Valance laughs at the absurd statement - and then beats him within an inch of his life while the stagecoach and other passengers run away. Stoddard is found and brought to town by Donaphan, who informs Stoddard that his determination to see Valance prosecuted and imprisoned is delusional - they are a territory town with a limp stick of a marshal and no law enforcement presence at all. Donaphan tells Stoddard that if he wants to fix Valance, he'll have to do it himself. Stoddard replies, "Do you hear what you're saying to me? You're saying the exact same thing that Liberty Valance said - that your gun, not the law, is what rules." He goes on to say that he, instead, believes in the power and arm of the law. To which he is told, the only law is the law you keep and the law you take into your own hands. "The point of a gun was the only law that Liberty understood...."
In a following scene, Liberty Valance finally comes to town. By this point, Stoddard is healing up and working at the local restaurant for room and board. One night, Liberty Valance comes to eat. Donaphan is also there, eating and visiting the local beauty, Hallie. 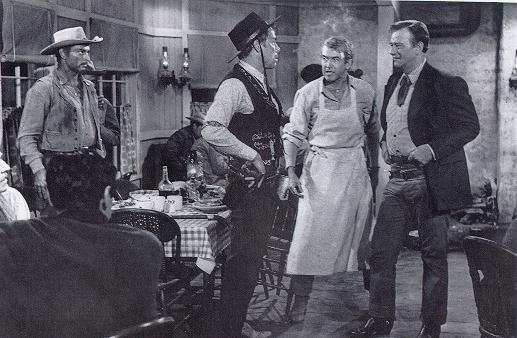 Stoddard is waiting tables, and when he is taking Donaphan his steak, Liberty Valance trips him. Obviously, he recognized him from the hold-up and was trying to provoke him. He falls flat on his face and the food is spread across the floor. Valance teases him about waiting tables (not a unisex job at this time). Stoddard tries to ignore him, but Valance doesn't relent. Finally, Donaphan steps in and tells Valance to pick up the spilled steak. Valance and Donaphan have a stand off over who will pick up the steak. Stoddard is put out. He can't believe the tension in the room over a dropped steak. He picks up the steak, smacks it on the table and says, "There! There's your steak!" At which point Valance leaves. Donaphan asks him why he picked up the steak. Stoddard basically says, because it was a stupid argument and I couldn't believe you were going to kill each other over one lousy steak. Of course, Donaphan - and the viewers - know that it wasn't about the steak. It was about respect, authority, and the very rural sense of law and order. It was about proving to Valance that he can't waltz in and behave how he wants in someone else's town (he's not a local, just a highwayman). But Donpahan knows that Stoddard isn't ready to understand all that. So when Stoddard asks him why he got involved, he shrugs and says, "It was my steak." This seems an inadequate response, and sends Stoddard over the edge. When Stoddard finally does take up a gun, it's not in self defense. It's because he finally realizes that laws are just words on paper to someone who doesn't respect them as long as no one is willing to enforce them. His friend is nearly beaten to death by Valance, and he is told that unless he is in the street with a gun in his hand at sundown, Valance will come and find him. So he takes his gun and stands in the street, even though "he can't shoot the hat off his own hand with the gun in his hand," according to the town marshall. Valance meets him in the street. They both raise their guns and pull the trigger. Stoddard was faster, and by a miracle, kills Valance. Later, we see him unable to shake the guilt of killing a man. Yes, it was in self-defense. Yes, Valance was a bad man - a serial killer, actually. And yes, he deserved to die. No one disputes those facts. But Stoddard isn't a killer. He never wanted to kill Valance. He wanted to see him brought to justice under the law, which granted would have justly ended in a hanging, but it would have been at the sentencing of a judge. Realizing Stoddard can't forgive himself and what it would mean to his relationship with Hallie, Donaphan corners him and tells him the truth. Stoddard didn't shoot Liberty Valance. While he was standing in the street, Donaphan was in an alley. Timing his shot perfectly, he shot and killed Valance in such a way as to make it appear to everyone - even Stoddard - that he had killed Valance. This assuages Stoddard's guilt and lets him go on to be the rising star of the territory - culminating in become the first US Senator from the newly formed state. The question that nobody really asks, that the viewer is left to ask, is why did Donaphan kill Valance then? Modern sensabilities consider "cowboy" to mean vigilante, but that wasn't the case. Donaphan had both the skill and the justification to kill Valance at any time, since Valance was a monster. But he didn't. He didn't believe in vigilante justice any more than Stoddard did. However, he understood better than Stoddard that "order" sometimes precedes "law," not the other way around. In fact, in the opening scenes of the movie, pre-flashback, the same collection of characters - now significantly older - are gathered for Donaphan's funeral. We learn that "he hasn't carried a gun for years," since the town got "civilized," the territory achieved statehood and formal law enforcement was in place. He says he killed Valance to save Stoddard, because Hallie was in love with him, even though Donaphan was in love with her. And he told Stoddard he did because "[Donaphan] could live with it, but you can't." Donaphan wasn't interested in throwing his weight around for the heck of it. He wasn't a vigilante, trying to clean out the town's miscreants just because they were there. He didn't carry a gun as a compensation device, or as a bullying tool. He carried one - and used it - when it was necessary. And when it was no longer necessary, he hung up his gun belt. That's the story most today and most around the world miss. Cowboys weren't sadists or renegades. They were regular, hardworking contributors to society. They were naturally tough, of course, which comes from living in the wild and learning to be willing to do whatever was necessary, no matter how hard it was. It's no wonder Cowboys achieved the mythic status they did, the idea of which is beautifully included in the final scene of the movie. Stoddard and Hallie, now some 30-odd years later and US Senator and Mrs. Stoddard, are headed out of Shinbone on the train "back east." The conductor comes to Stoddard and tells him that they've put extra steam in the engine to get him to his connecting train even faster, and that the state is holding the express train for him at the next station, to get him back to Washington in as little as 4 days. Stoddard thanks him and says, as US Senator, he'll be sure to write and thank the locomotive company for its consideration. The conductor slaps him on the back and says, "Think nothing of it. Nothin's too good for the man who shot Liberty Valance!" so this has nothing to do with your post, but Ben and I went on a date last night and he did the arm thing in our picture, you know what I am talking about, I made him put it down. I wanted to tell you about it, and then I realized your beautiful blue eyed man is doing it in your picture up top! hahahaha. I haven't seen this movie but feel that I must! I love the good ol American Cowboy. I lived in Texas for almost 30 years before I married my Soldier and moved away. My heart will always be there and I will always have a soft spot for a cowboy. THANK you for this post. I'm living in Australia for a year, and was having an interesting conversation about the difference between George W. Bush and Barack Obama. And explaining how their media (as well as ours) portrays them incorrectly. The fact that one of them thought Obama was "cool" is a whole different subject, but I was having a little difficulty explaining the concept of the cowboy, as Americans see them, and why George W. Bush, as a Texan, Southern boy, and yes, cowboy, could be looked up to by the majority of Americans. I understand it, because I grew up here. It makes you think, when you try to explain to someone from a different country. This will help a lot.